The Modcloth sale is going strong and I had to resist quite a few deals. 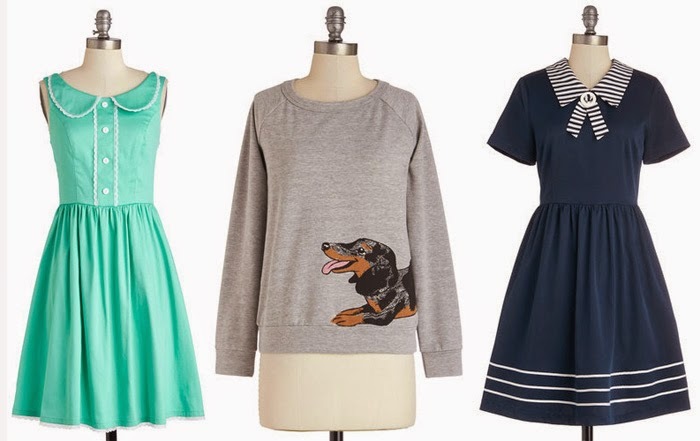 I picked these two dresses above and the sweater that looks like Tallulah. I'm super happy and satisfied with my purchases. I know I'll wear these over and over. Plus I have that mint dress in yellow so I know it'll fit. I hit my personal spending limit so I left quite a few amazing items behind. Here is a wishlist of things I'd buy right now if I had all the monies. I definitely considered getting that mint dress, since I loved the yellow version on you, but I have SO many mint things! I also was tempted by the 1-shouldered Bernie, but wasn't thrilled with the reviews. Love the ant dress, too. So many cute things! Aw I need more mint things, I'm inspired by the pastel life of you and Kate! I liked the Bernie dress, but am not a fan of one-shoulder. The only thing that is kind of hurting not to have is 1 and 3 on my wishlist. I feel like I'd really wear those a lot. It seems like a lot of bloggers have #3. You're the second person that I've seen post that scenic print dress. It's so stinking cute! I've seen a skirt with a very similar print, and I might have to grab it once my self imposed austerity period ends. You are strong, it was hard to stop at 3! I feel like I definitely would've taken the scenic print dress if it haden't been one-shoulder. Super cute print though.